Hi, fellas! Is there anyone here who is a fan of Sherlock Holmes? Do you know who created him? @jkcrawling: Sir Arthur Conan Doyle? @AzwarSD: Sir Arthur Conan Doyle. Exactly! Today we’ll be talking about Sir Arthur Conan Doyle, and his influence in creating Sherlock Holmes! Born in 22 May 1859, Doyle started his career as a doctor before finally pursued writing for living. Have you ever wondered if Holmes was a real-life character? Doyle surely learned about science of deduction from somewhere! To understand that, first we need to know Doyle’s background as a physician. Doyle graduated from University of Edinburgh Medical School, Scotland, UK, in 1881. He had always loved writing stories, and his life changed when he was being taught by Dr. Joseph Bell. Dr. Bell has a unique ability. When a student entered class, he was able to tell what he ate for lunch or where he had been. His observation skills earned him the title as the pioneer of forensic science, bridging medicine and crime investigation. Dr. Bell was often requested to testify in courts as expert witness. He had helped solve murders at least twice! Doyle worked for Dr. Bell at the Edinburgh Royal Infirmary in 1877. He was so impressed and learned as much as he could. As a tribute, he created a new character – a detective – based on his former lecturer. 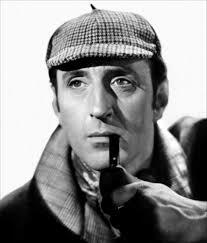 So, Sherlock Holmes was not a real-life character. But he was inspired by a real person. Do you have any questions about English words used in this session? Mention us! @eka_supriyadi: Admin numpang tanya, kalimat. But he was inspired by a real person. Kenapa he was inspired, bukan, he inspired? Meanwhile, back in university, Doyle had a roommate named James Watson. So, in a way, we can say that Dr. Watson did exist! Thanks for reading, fellas. Hope you have a good night rest before Monday starts! @ShirtlessDrivr: when I went to London and visited Sherlock’s Museum, I was in awe. It was as if he lived there and was away for a while.